I launched Courtney Beyer Design in January of 2017, so the new year also marks the anniversary of starting my own business! I felt like I was always on a growth curve this year and I tried so many new things - lots of success and failures, but mostly a lot of hard work. In late December of 2017 I was feeling stressed about the year, primarily realizing how uncomfortable I felt most of the time. Not a healthy mindset at all. This post is for me to look back and see what I learned and did this year - take it all in a feel some pride. I also have reflected on how much my family and friends have supported me this year - big hugs and kisses and thank yous! Thank you for joining me on this crazy journey this past year! My Instagram post for best nine! I launched Courtney Beyer Design and created my website! It was not pretty, and I used my IG feed as the homepage of images. Kind of wish I had a screenshot but glad on the other hand?! I also launched my Etsy store. My first products were hand block printed Valentine’s Day Cards. This was the first time selling my art. I created a large wall art piece. The white wall behind the TV had been staring at me for years, and the art I had found just did not work. This was a personal project to practice making crazy ideas a reality. I love the results, and it is still up today. It is a reminder that I one day want to do large-scale installation or mural. so many shape and colors! The final installation. So much color - movement and blends perfectly with the other colors of the house. I also added spring themed block print cards and tea towels to my Etsy shop. This doubled the number of products in my store. The tea towels were wildly popular. During these months I was hand drawing a lot of designs but still had not figured out how to make digital patterns. Many tears, skillshare videos, and hours later I finally figured it out! 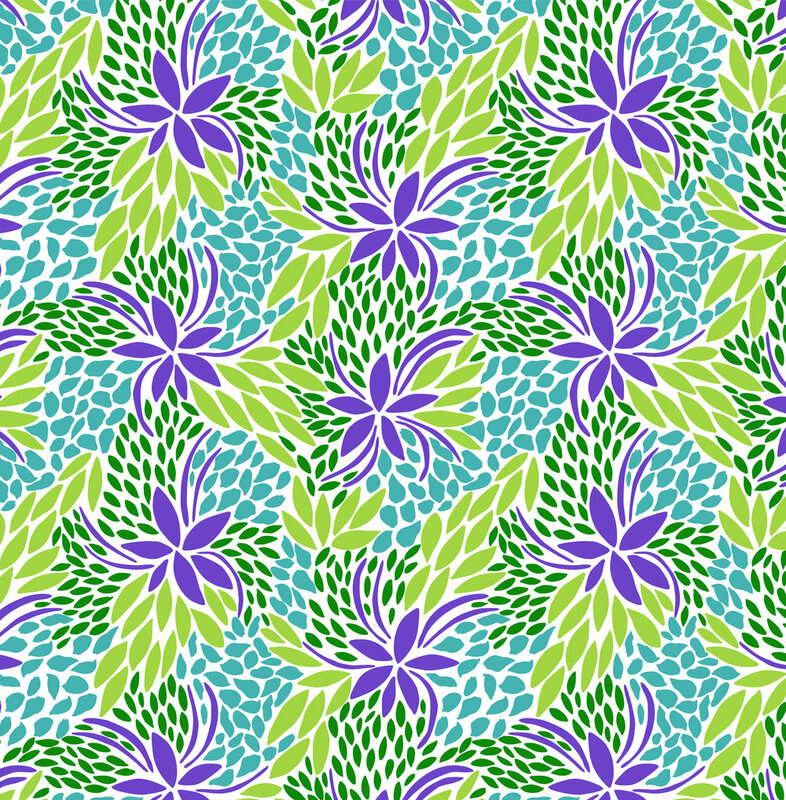 The last day of March I finally created my 1st repeat pattern based on my hand drawings. This was a turning point in creating digital repeating patterns from my hand drawings. You can see my illustrator art board with the tile and then the full seamless repeat next to it! After I made my first pattern, my second pattern was used by Body Zone Swim for one of their swimsuits. It was so exciting to see my pattern on a suit! I still wear my suit today. You can read more about the design process here. Suit on the left and pattern on the right! I had my 1st pop-up shop at West Elm the first week of April. Making the call to ask to have a pop-up so so scary and I did not feel ready at all! Now I feel so comfortable doing pop-ups, but I also learned that I do not like doing pop-up shops. There is a lot of waiting which is hard for me. I also realized that selling my block printed products is not going to be a sustainable business. I am so happy that I did go through the process of figuring out how to sell products in person. I lead my 1st corporate block printing workshop to a team of engineers. I loved enabling and encouraging people to feel creative. More about my workshops here. I started the 100-day project pledging to post 100 patterns hand drawn or digital. This project got me into a habit of creating and digitalizing on a daily basis. So much practice! My sister, Caitlin Beyer, took professional photos of my block prints and myself. She is a beyond fantastic photographer, and it was awesome to work together on a project. In June we went on a mom and sisters trip to Santa Fe, NM. It was a special trip to bond with my girls as well as be inspired by Georgia O’Keefe - her work and life as an artist. The colors of Santa Fe were unreal! One of the reasons my sister took photos was for my Brika shop page. I was accepted as a seller for the online store which was so exciting to expand my product reach. I also realized that it was a lot of work and for the sales I received. I have since closed the shop. Another lesson learned. I started selling my block print cards and tea towels at my first brick and mortar store, University Art in Redwood City. It is a gem of a local art store where I have bought my art supplies my whole life. It felt full circle! I also finished my 100-day project! This project pushed me to start to develop my style and then push it further. I also had enough patterns to update my website and created an online portfolio. The 100-day project also pushed me to explore the pattern design industry and what "it takes" to make money in the industry. My tea towels on display at University Art. Something I would not have believed back in Feb. In September I turned 31, a year since my career shifting trip to Spain and Morocco. I was honored that Uppercase Magazine posted about my trip and experience on their blog! I launched my bi-monthly newsletter - the repeat! You can sign up at the bottom of this page! It has been an excellent way for me to connect with my followers and industry professional with my most recent work. Sending out the newsletter was a huge hurdle for me, and it took me about three months to get enough courage to start sending it out. I am now fully committed and have sent out three newsletters so far! I joined an online community called the Textile Design Lab which offers classes and has groups for aspiring pattern designers. I took a mini-course in November that pushed me to apply to Design Studios to hopefully take me on as an artist. I have not be accepted yet but getting over the fear of reaching out was a more significant hurdle. I am not giving up yet! I designed a few holiday cards using my patterns and sold on Etsy and at one holiday fair. It was the first time that sold products with my pattern designs. Until this point, it was just block printed products. I loved how they turned out and am looking forward to making more products in 2018. What products do you want to see my patterns on? Thank you so much for following along on my first year of Courtney Beyer Design. I am so excited for year two. I am really going to focus on just creating patterns and my goal is to start selling and licensing. I also have realized it is going to take awhile to make money from selling my patterns. I am also excited to work as a UX design consultant, and illustration commissions to add to my income. It will be a balancing act for sure. The one thing I have learned from this year is that anything that makes me feel uncomfortable will eventually feel comfortable if I do not give up.